Ko’oloa’ula Phases I and II are part of the Department of Hawaiian Home Land’s East Kapolei II Development in Oahu’s Second City. 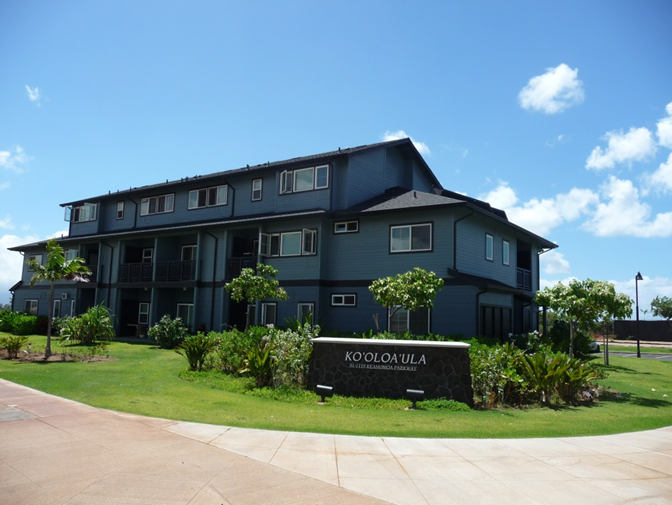 The Ko’oloa’ula Multifamily Development is comprised of 308 one, two, three, and four bedroom affordable units on 17.8 acres along East-West Road in Kapolei. In addition to the residential units, the development included community centers, laundry facilities, volleyball court, basketball court, and tot lot. Review of Sewer, Water, and Drainage Master Plans for the overall East Kapolei II development. Conduct meetings with affected agencies (City & County of Honolulu, State of Hawaii, and other project consultants). Preparation of Design Development drawings for grading and utilities. Prepare opinion of probable cost. Prepare Drainage and Storm Water Quality Reports. Prepare and process sewer connection, drain connection, and NPDES applications. Prepare construction plans, erosion control calculations, hydraulic calculations, technical specifications. Prepare quantity estimates and bid proposal schedule. Prepare construction contract documents for biding of sitework and assist in bidding/negotiations. Services during construction (periodic site visits, response to submittals and RFIs, review of contractor’s applications for payment, etc.). Construction project closeout including preparation of as-built drawings.